Reconnect with your womb, your ancestry and Mother Earth. 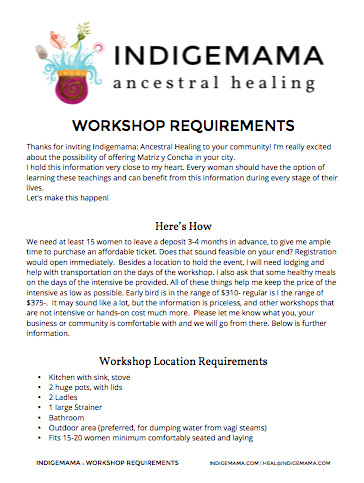 Thank you for your interest in hosting an Indigemama: Ancestral Healing workshop! Please download and read the PDF document (below) and then complete the Request Form on this page to begin the process. Can you tell me a bit about your organization/family/community? Where would the intensive be held? Can you tell me about the space? What are my options for lodging, nourishment, and a place to offer private sobadas? What type of community do you anticipate attending? Are there any costs I need to factor in to the price of the intensive? 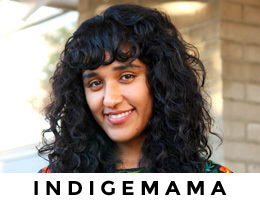 What are your expectations from me and Indigemama? What are my options for acquiring herbs and oils for the intensive? Is there anything unique, important, or specific you would like to offer? How accessible is raw milk, organic pastured meats, and fresh, organic foods? I am open to suggestion, flexible, and excited to co-create a transformative experience with you. Overhead costs have been kept low, and organization is simple and grassroots-style to help make this information accessible to as many women as possible, and to keep the spirit of this traditional healing art alive. I look over each request form in it’s entirety and meditate on each submission. Please allow 3-5 business days for a response. Click to download the PDF. Copyright © 2019 Indigemama: Ancestral Healing. Powered by WordPress. Theme: Spacious by ThemeGrill.